Sometimes I have ideas. Actually scratch that. All the time I have ideas. A million ideas zoom through my brain in a day, some make it, some don't...some are forgotten before I can work through them. 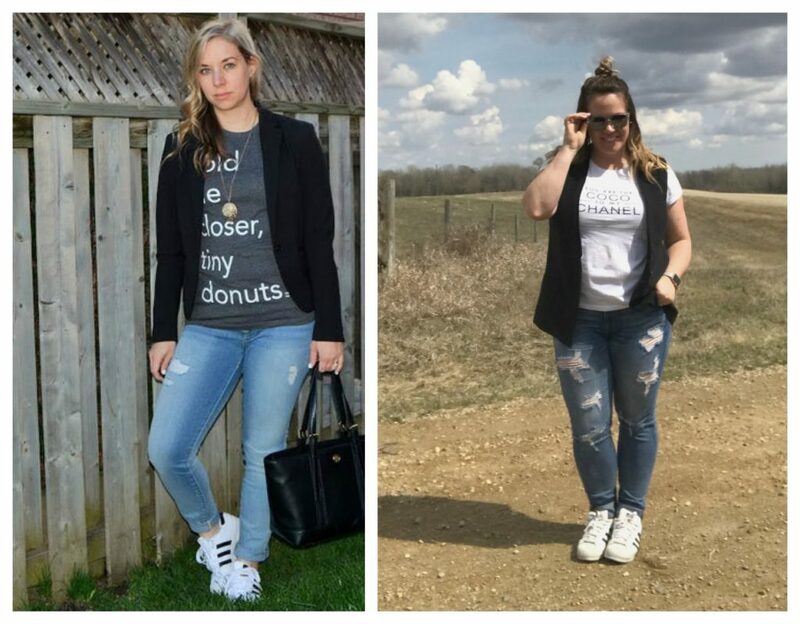 This month's Fashion link up on the Blended Blog is one of those ideas and it came from the fact that I like copying people. Or I like taking someone's personal style and making it my own. So our theme is what inspires you and you can head over the post on the Blended Blog to see one of the two outfits I put together this week. Yes, that's right, went from being lost in blogland to doing more than I normally would in a week. But whatevs, I'm wearing clothes and that's a good thing. Husband will likely disagree. So I have this Pinterest board going of random outfits that I have really wanted to recreate, you should check it out...there are tons of familiar faces on it and I thought I'd start today with this hot momma that I get to hug in 15 days from now. I picked this picture because this is basically my everyday outfit and it was easy. I'd go into the outfit deets but it's late and my wine is calling me. Also, everything is old and likely can't be linked anyway. I can tell you where they're from (I have a weird memory that way- ask me where I got any piece and I can name store and possibly even time frame....ask me what I was going to get when I went downstairs to get something and I don't have a freaking clue)....right. So the outfit. Sunglasses from Simons. Those are new. I should find them because I love them and you will too. Graphic Tee from a random online shop that I can't remember. Black vest from RW. Jeans from Express. Adidas Superstars from everywhere, you should get a pair or 8. I love the green or the gold ones going around right meow. 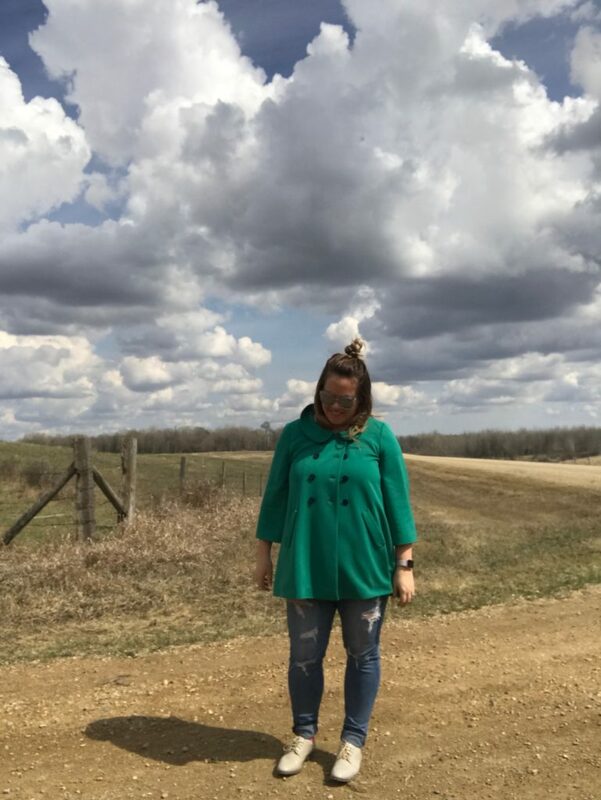 This is actually what I wore the day I took those pictures, that vest and graphic tee are under this fun jacket and I had swapped out my Superstars for these oxfords because I had to go for an adventure on the 60 acres to find the ideal location to put a house. Pretty loafers and fun coats are not conducive to walking in manure. In case you were wondering. You and Shaunacy two of my favs. I feel like I'm failing with the theme, you know I'm good at re-creates but I had my month pre planned for the most part and my brain can barely function these days so I'm thrilled to see you running with this! CUTE green coat too!! I love that you picked Shaunacy as your inspiration! Love a good graphic tee and both of yours are so fun! Lol you crack me up! Love how real you are! You have the best graphic tee collection. Seeing you and Shaunacey side by side makes me so excited for 13 days from now!!! Y'all have the best graphic tees. I totally just saw your post on Facebook too and realized that your posts haven't been showing up in my feed on Bloglovin. What the french, toast?! You and Shaunacey! I remember when she had those shoes sent to Sarah to bring to Vegas. You both rocked the look! Sometimes the best outfits are created from your old favorites. Love that you picked one of our own to copy! You pretty much nailed it! I am with you - I can remember weird dates, times, etc. - I love that you re-created a look from one of our own. I can't figure out how to comment on the Blended Blog post, but you need to know I love those shoes and can't wait until Friday! Which is tomorrow! Hooray for Fridays! Love this idea for our Wednesdays this month! You totally nailed Shaunacey's look! Can't wait to see you so soon! Ditto what Sheila said. Imitation is the fondest form of flattery. but fun looking farm boots, right? yes! totally forgot about that. weird...my blog has been giving me major issues lately...I am actually in the process of switching back to blogger from wordpress because I'm over it. it's been fun to take charge! She is a fun lady in general, so even more fun to dress like her. lol- way too cool for manure. I have wondered about doing that eventually too. Like when I am blogging way less maybe. Nice to know it can br done. They all showed up at once the very next day.